My grade 7 daughter was volunteering with the Canadian Opera Company at a summer camp. It was in downtown Toronto and I felt awful knowing it was going to be a good 40 minutes to get there. I soon discovered it was likely the fried rice she had for lunch that made her sick. What my husband didn’t know is fried rice, even if put into a heated thermos and piping hot is not safe to send for lunch. So here you go. Learn from our mistakes! These tips centre around this basic food safety principle: keep hot foods hot and cold foods cold, otherwise bacteria can grow and after 2 hours it’s not safe to eat. ✔ Suits smaller kid-sized portions. It’s more likely to fit into their lunch bag too. ✔ Has a wide-mouth. It’s easier to get a spoon into it and it’s easier to clean than a tall, narrow thermos. TIP: Check that your child can open and close their thermos. Young kids may need to ask for help at school opening a thermos to avoid scalding themselves. ✔ Saucy foods like stew, chili, curry, pasta, or hot oatmeal. TIP: Food will only stay hot or cold in a thermos if it has some liquid. ✔ Do not use a thermos for dry food like fried rice or scrambled eggs. The food will not stay hot. It’s better to send food like Lunchbox Veggie-Cheese Muffin Frittatas cold with an ice pack. 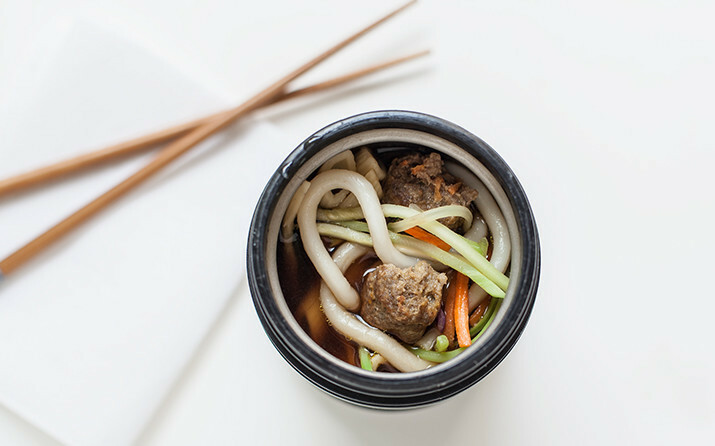 TIP: Turn dry dinner leftovers like meatballs into a soup by adding some broth. Try: Speedy Meatball Minestrone. The fried rice my husband packed up could easily have been turned into a soup too. ✔ Chill your thermos first. Put it in the fridge or freezer or put some ice and cold water into it. Add your cold food or drinks quickly and put the lid on the thermos right away to keep it cold. TIP: To keep your food cold (or hot) the longest, pack up your thermos just before leaving the house. ✔ First warm up your thermos with boiling water. Let it sit for a few minutes with the lid on, then drain the water. Quickly add the piping hot food/drink and put the lid on. By “piping hot”, I mean scald-your-mouth hot (at or above 74°C or 165°F), not ready-to -eat hot. Have you learned a food safety tip the hard way? Kindly share it here. We can all learn from each others’ mistakes. To find out more about food safety, check out Be Food Safe.